Soil plays a pivotal role in enhancing global water and food security. Irrigation water constitutes more than 70% of the global water demand. The anticipated demographic increase and changing climate will impose more pressures on the global water and food systems. Therefore, and to achieve the target of “more crop per drop per area”, water management plans must be based on more accurate quantitative and dynamic approaches. 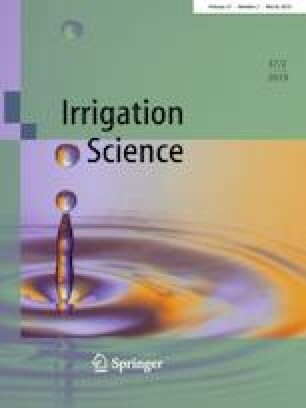 It is increasingly obvious that the unique aggregates structure of the soil medium regulates water and nutrient circulations, and consequently defines soil and water health, productivity, and water use efficiency. However, the soil aggregates structure is not currently well considered in the quantification of soil–water holding properties. The authors applied a thermodynamic and soil structure-based approach to quantify soil–water holding properties. Specifically, the paper aims at providing a methodology, based on the pedostructure concept, to quantify field capacity (FC), permanent wilting point (PWP), and plant available water (AW). Pedostructure is a representative aggregates unit of a soil horizon that describes the structural organization of the soil medium. Four types of soil were analyzed considering various soil texture and aggregates structure: loamy fine sand, silt loam, clay loam, and silty clay loam. The calculated values for FC and PWP, based on the proposed pedostructure method, were compared with the recommended values by the standard FAO method and soil suction method. Results showed good agreement between the calculated values of the two methods. The proposed pedostructure method introduces a shift in quantifying the plant available water from a texture-based estimation to a soil aggregates structure-based calculation. Such a shift will enable capturing the changes in soil aggregates structure due to agro-environmental practices and the associated impact of these changes on soil–water holding properties. The authors wish to acknowledge TAMUS WEF Nexus Initiative and the WEF Nexus research group for their support of this work. The authors would like to express a special acknowledgement to Mary Schweitzer and Sonja Loy from the WEF nexus team at Texas A&M University.